Ice Cream, why bother making it when you can simply buy it. Well, one because buying good ice cream is expensive. Two, homemade ice cream is nothing like the store bought stuff, the flavour combinations are endless, you just can't buy it. Three, it is so easy to do. Recently while on holidays in Croatia we tried so many new flavours of ice creams, you can't buy half of them in the supermarket, you need to make it yourself. So I promised my kids I would start making ice cream when we got home and this is flavour number 3. So far I have been very successful. And this ice cream, is delicious. The cheesecake flavour is so good. I love this recipe as a lot of recipes require just egg yolks to make the custard, and a lot of them. That is fine if I have been making pavlovas, but when I haven't this recipe comes into play. It uses 2 whole eggs, you can even make it with one, I added a second egg to the original recipe, a few other ingredients and you have creamy delicious cheesecake ice cream that you can flavour however you like. Now I use an ice cream machine, and I advise you to buy one. It doesn't have to be the most expensive one. I have two and I use the cheap one I bought years ago, as I don't throw things out, it works, and until it dies I will use it. The second one I bought as it was on sale and it was one of my I had to have it purchases. If you really don't want to buy an ice cream machine, it is slightly more labour intensive, but nothing over the top. Just follow these steps. You put the cooled ice cream base into a covered container, place it in the freezer and whip it out every hour for 3 hours as it freezes and give it a good beating, either with an electric whisk, by hand or in the food processor. This gets rid of the ice crystals that form, and allows the ice cream to be smooth, not crunchy. You could use the juice of just one lime, but I found it needed more. So you might like to add the juice of 1 lime at first, taste, and if you find it needs more, add it. I used about 100ml of lime juice. You can use thickened cream instead of double cream, I have used both as I had them in the refrigerator and both worked in this recipe, even a combination of the two creams worked. If using only thickened cream, lightly whip it before adding it to the custard. If your custard looks like it has split. Just fill a sink with cold water and plunge your saucepan into it, keep whisking, the custard should come back together. This hasn't happened in this recipe for me yet, but it is good to know. 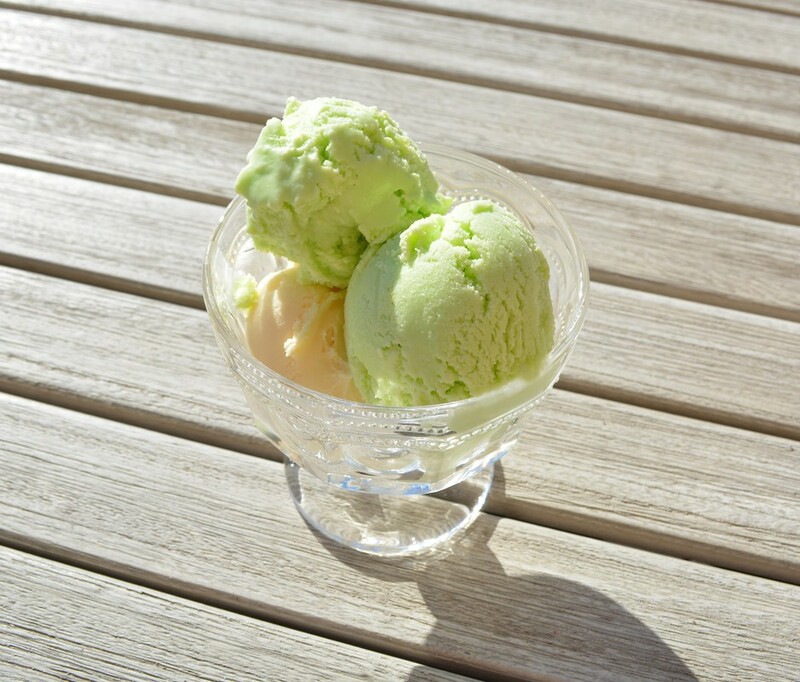 So if you love cheesecake, and especially lime cheesecake, you need to make this ice cream. The flavour is so fresh and tangy and you just can't buy that. Heat the milk over low heat, in a small saucepan, do not let it boil. While it's getting warm, beat together the sugar, cream cheese, vanilla and eggs in a bowl. Still whisking, pour the hot milk into the cream cheese mixture and pour into a clean medium sized saucepan. Place the milk mixture over a low-medium heat, stirring constantly and cook until you get a velvety custard, the mixture will thicken and coat the back of a spoon. Pour the custard into a bowl and let it cool, for about 15-20 minutes. Once cooled add the zest, juice of 1 lime and then the double cream. Taste it, if it needs more lime flavour, add the juice of 1 more lime. Place in your ice cream machine and churn until thick and ice creamy. If you don't have an ice cream machine see my notes above. Once it is thick, add in the crushed biscuits, if using. ​Pour into an ice cream container. Place in the freezer for at least 4-6 hours, until set, or until needed. 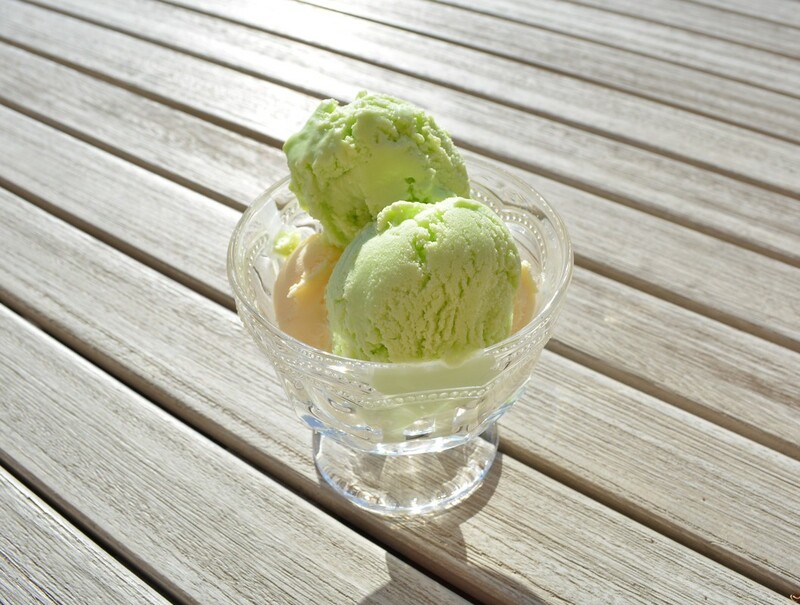 To serve, take the ice cream out of the freezer 20 minutes before serving, it needs to soften slightly before serving. You want it frozen, but not rock hard. After 20 minutes, scoop out into bowls or cones. Serve immediately.